This season has been particularly fruitful for the Warriors in terms of individual accolades. 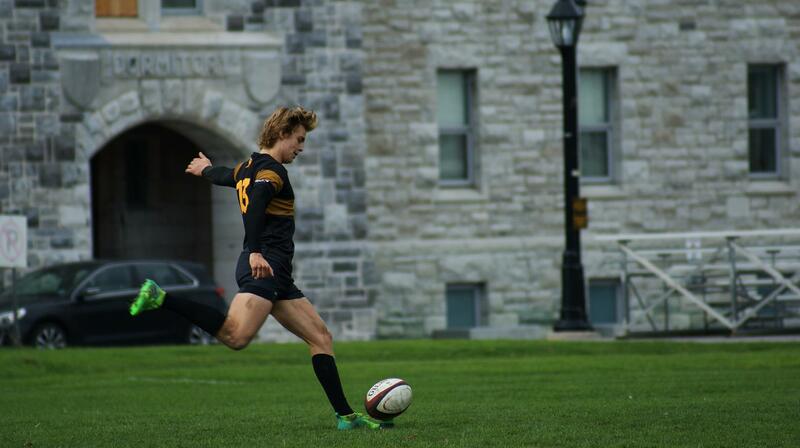 After Warriors bagged major individual honours in OUA Football, the Men’s Rugby team has also shown its potential after Mitch Voralek was named the OUA player of the year and Ben Scher was named in the all-star team. The reason the Warriors Rugby team was able to have one of its best seasons in the last ten years is all down to the individual talent, in the form of Voralek and Scher. Voralek personifies consistency in that he carried his impeccable form from previous seasons, when he finished third and fourth respectively in scoring charts, to finishing the top scorer in OUA Rugby scoring charts. His statistics for this season have been phenomenal as he finished with 124 points, 37 converts and 10 penalties. He completed 77 per cent of his 61 kick attempts and 17 of his points came in post-season, thus solidifying his status as a clutch player. Voralek has also shown has adaptability this season as he changed to a different position on pitch. In his role as the outside centre this season he continued to showcase his flawless playmaking skills as he, in addition to his excellent scoring, provided eight tries. Throughout the season, Voralek made his impact across the field. He was not only an ever-present threat in attack but he also made his presence felt in the defence. He organized his backline, made precise tackles, and using his pace to his advantage, he shut down outside attacks. His record-breaking season greatly pleased the Warriors’ Head Coach Tyler Greer, who said, “I am very proud that Mitch is the MVP of the OUA.” Mitch bust on to the scene winning Athlete of the Week in his second ever game and hasn’t looked back since. He is a hard working leader who is consistently getting better every week. Our team has been incredible this year and they have given him so many opportunities to score points this season,” he said. Scher, who was named in the all-star team this season, immaculately performed in his role as the fly half this season. And considering that this is Scher’s first year at UW, makes this achievement to be named an all-star all the more impressive. Scher’s individual stats might sell him short but he made his impact on the field in more important ways. For instance his awe-inspiring leadership made a crucially positive impact in the positioning of the Warriors. He controlled the tempo of the games he participated in, and was the catalyst in making warriors play up-tempo style of play. On his impact on the team Greer said, “Ben made a huge impact in his first season with the Warriors. He brought a lot of on field leadership and rugby IQ to go along with his play making skills to the team this year,” he said. With the future of Warriors rugby looking bright as ever, Warriors’ fans can finally start dreaming about winning championships next season.